ADJUSTABLE: fully adjustable hanging cord allows you to customize the fixture to your lighting needs and desired look. Maximum Hanging Length: 63"; Minimum Hanging Length: 15"
Frosted plastic shade and brushed nickel pair perfectly to add a timeless sophistication and contemporary charm to any space with Globe Electric's Amaris 1-Light Plug-In Pendant. Blending with all dicor styles you can place this fixture anywhere in your home. Fully dimmable with a compatible dimmer switch, you can create lighting ambiance and different moods easily. The 15-foot cord allows you to adjust the hanging length and position without worrying where your wall socket is placed. Ideally suited for kitchens, restaurants, bars and dining rooms you can use the Amaris 1-Light Pendant anywhere you need a creative light. Requires one 60W max E26 bulb (sold separately). Check out Globe Electric's selection of vintage Edison inspired bulbs to create a truly unique look. The Hampton Bay Hayes 3-Light Pendant adds a touch of sophistication and warmth to many rooms throughout the home. Perfect for eat in kitchens, dining rooms or foyer applications. This fixture features an off-white fabric inner shade and a metal decorative basket for aesthetic appeal. This fixture compliments many home styles and decors. Installation is easy and will add a timeless look at a great value for years to come. 1-Light Vintage Hanging Pendant Light Fixture in Oil Rubbed Bronze with Gold Interior Fashioned after factory and barn lighting Globe Electric's Flo 1-Light Pendant adds a modern industrial feel to any space. This hanging ceiling pendant can be fully dimmable, allowing you to customize lighting ambiance and mood. Ideal for use in kitchens, restaurants, bars, and dining rooms - the exposed bulb in this fixture delivers the perfect look. Includes all mounting hardware for quick and easy installation and requires one medium base 60W light bulb (sold separately). 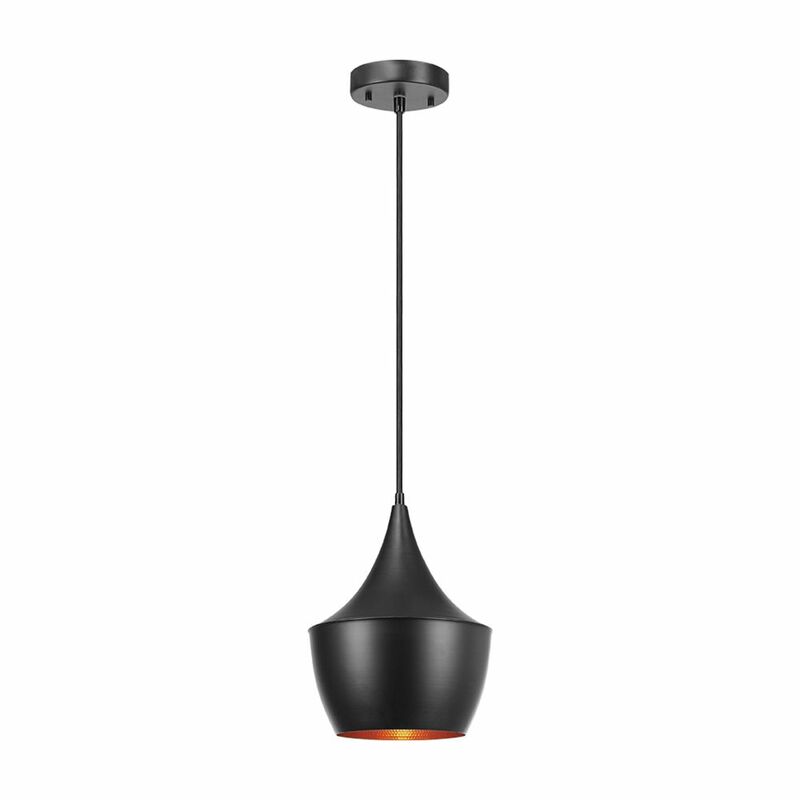 1-Light Vintage Hanging Pendant Light Fixture in Oil Rubbed Bronze with Gold Interior is rated 3.9 out of 5 by 12. Rated 5 out of 5 by Ron from The product looks good, was fairly easy to install, and is adjustable for height. It does have a ... The product looks good, was fairly easy to install, and is adjustable for height. It does have a 60w limit, but with an LED bulb the lumens can be increased. Rated 4 out of 5 by RH2018 from Very Modern! I looked awhile for new lights over my island and found these! So far pretty happy with the modern farm house look they give off! Shipping was very quick! Rated 4 out of 5 by RoseAnne from Looks great! Feels kind of cheap but it looks great and matches my kitchen! I love them! Rated 5 out of 5 by CandyL from Great value for the price! Good looking pendant with gold interior, but it was too big for my is... Great value for the price! Good looking pendant with gold interior, but it was too big for my island so I returned it. Too bad, I wish it fit because I loved it. Rated 3 out of 5 by EmilyMarie2 from A little uneven at the bottom I like the looks of this light in its place. My husband pointed out that the bottom is not flat but wavy. I'm not sure whether it is supposed to be that way but I doubt it. I does have a faint brown hue to it although it looks black while hanging. It suits my decor and the price was right. If the bottom was flat I would definitely recommend it. Rated 5 out of 5 by Carolyn from Cosy lights at a good price We installed three of these pendants in our new home and we love them. Due to the copper-painted interior, they light they give off is very warm independent of the bulb your choose; they wouldn’t work well as the only source of light or as a task light, but for warming up the atmosphere of a room they do nicely. Easy to install and we thought the price was very reasonable. Rated 5 out of 5 by Bambi from Nice size for cluster of lights. Flat black with gold inside which allows for a slightly radiatin... Nice size for cluster of lights. Flat black with gold inside which allows for a slightly radiating shimmer when turned on. Modern, industrial, gorgeousness.